Nice Price Or Crack Pipe: Wizard Of Oz Tin Man's '69 Cadillac For More Than $9600? There's no end to the Nice Price Or Crack Pipe choices here, even after 57% of voters went with "Nice Price" on the $4,500 Twin Stick Turbo Colt Bumper Car yesterday. 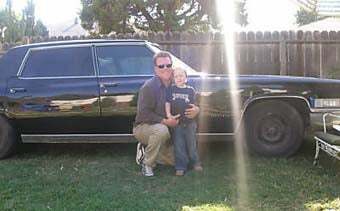 Today we're going to explore the value of fame in a car, in this case a '69 Cadillac Fleetwood- a cool machine in its own right- that was once owned by Jack Haley, the man who played the Tin Man in The Wizard Of Oz. The last time it went up on eBay, the $9,600 top bid failed to meet the reserve, so it's apparent that the seller feels the Tin Man connection to be an extremely valuable one. That's apparent in his selection of photographs; when the car itself isn't as important as its intangibles, you shoot the photos with the sun behind the car and your family posed in front of it, throwing in a single shot of the hood emblem for good measure. Well, what do you think? Cool car, interesting past… but worth over $9,600? Will meeting the reserve on this Fleetwood give the Tin Man a new heart?